The Hampton Inn Atlanta-Perimeter Center hotel is located in the Perimeter Mall area north of downtown Atlanta Georgia. We are .5 miles from MARTA and offer convenient access to 285 GA 400 shopping the corporate district Buckhead and downtown Atlanta Georgia. 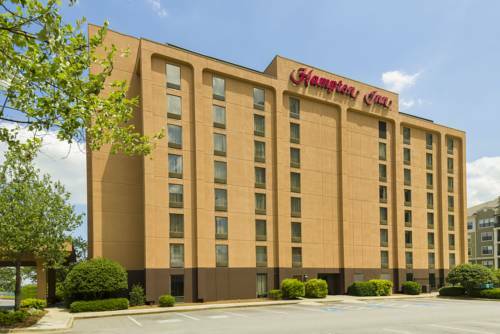 The Hampton Inn Atlanta-Perimeter Center is 7 miles from Lenox Square Mall and Buckhead. Within 2 miles of this Hampton Inn hotel guests can dine at American Pie Bar Atlanta Bread Co Brio Tuscan Grill Chili*s Cheescake Factory Chequers Bar - Grill Garrison*s Broiler - Tap Houston*s Maggiano*s McCormick - Schmick*s P.F. Chang*s China Bistro Ruth*s Chris Steak House and 5 Season*s Brewing Company. The Hampton Inn Atlanta-Perimeter Center hotel features 8 stories interior corridors outdoor pool exercise gym and meeting facilities for up to 60 people. Hampton Inn hotel guests visiting Atlanta Georgia enjoy amenities which include deluxe complimentary continental breakfast complimentary local calls in-room coffeemaker hair dryers irons and ironing boards and cable TV. Cribs and rollaways are available for our Atlanta Georgia hotel guests. Laundry/valet services meeting/banquet facilities and connecting rooms are available for a nominal fee for our hotel guests. We love having you here in Georgia at the Hampton Inn Atlanta-Perimeter Center hotel. Great Steaks fun western atmosphere.